LITTLE ENGINEERS WILL LOVE THE ACTION-PACKED ESCAPADES IN Chuggington: Chuggineers Ready to Build TO BE RELEASED THIS FALL! July 21, 2014 - We're talking big-time adventure. 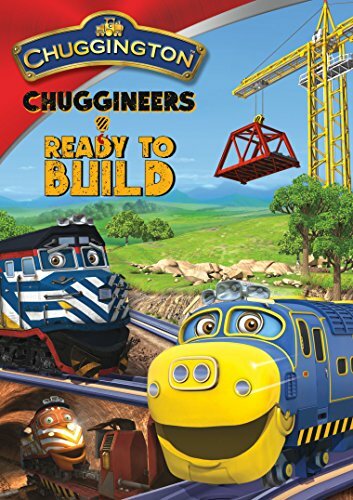 The strongest and most dependable construction crew in Chuggington is Ready to Build in the newest "Chuggington(TM)" DVD from Anchor Bay Entertainment. A brand-new collection of five fast-paced adventures - including the extended new special slated to premiere on Disney Junior this fall, Chuggineers Ready to Build will make tracks to retail nationwide, October 14, 2014. In this special collection of hard-working adventures - including the "We are the Chuggineers" music video! - Brewster joins Chuggineers Zack, Fletch and Tyne to build tracks, bridges and tunnels, make repairs, haul heavy loads and more! Featuring new wagons and machines, including the massive yellow Mega Chug Crane, and new friends Payce, the tunnel runner from Tootington, and Cormac, the cheeky forklift engine, "Chuggineers Ready To Build" (SRP: $14.98) will help Wilson, Brewster, Koko and little trainees at home discover important lessons about safety, responsibility and teamwork. *	"Chuggineers: Ready to Build Special"
*	New Music Video: "We are the Chuggineers!" *	Badge Quest Episode: "Night Chuggers"
For even more "traintastic" fun, young fans will receive a special two-sided Chuggington Collector Poster inside each new DVD! The exclusive free poster features all of the characters - from the Trainees to the Chuggers - as well as a colorful Chuggington scene. A colorful and contemporary CGI-animated TV show from Ludorum that reinforces early social readiness skills, "Chuggington" airs daily on Disney Junior. The series made its Season 4 debut on Disney Junior in October 2013 with the first-ever primetime "Chuggington" special, "Chug Patrol: Ready to Rescue." "Chuggington" has become a global sensation since its debut in September 2008 in the U.K. The show has been licensed to more than 175 territories worldwide and has established ratings records in several key international markets, including the U.K., Germany, France and Australia. The series made its U.S. debut in January 2010. "Chuggington" is a contemporary, action-based, energetic and vibrant CGI series for children ages 2-5. The series follows the adventures of three young trainees - Wilson and his friends Brewster and Koko - as they ride the rails and take on exciting challenges that test their courage, speed and determination. Along the way, and with help and support from a strong community of engines and people, they learn positive values and new skills that empower them to become the best trainees they can be. Further information is available at www.chuggington.com.